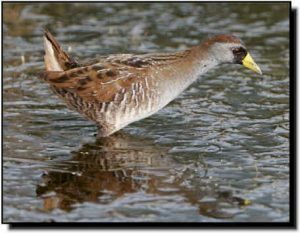 Comments: With their medium size, bright, yellow bill and black face mask extending down the throat, Soras are easy to identify and not likely to be confused with other rail species. Their distinctive call, a high pitched descending whinny, is a common sound associated with wetlands. Soras are the most abundant and widespread of North American rails. They are likely to be encountered in freshwater marshes throughout the Great Plains during breeding and migration.